There was a vicious crack as Jenny blew open the doors and the Wabbit and Lapinette were out and running. "What's she got in that hook?" yelled Lapinette. "Astrolite G," shouted the Wabbit. "You don't cut corners," panted Lapinette as she clutched the precious disc. "One day you'll destroy the whole city." "Throw the disc!" commanded the Wabbit. Lapinette tried very hard to throw it but the record remained attached to her paw. "You have to throw it" repeated the Wabbit. " I can't," she sighed, "it's stuck fast." "Does it have the sign?" yelled the Wabbit. Lapinette ran the edge of her paw round the inside of the record. "It has something, I can feel it." 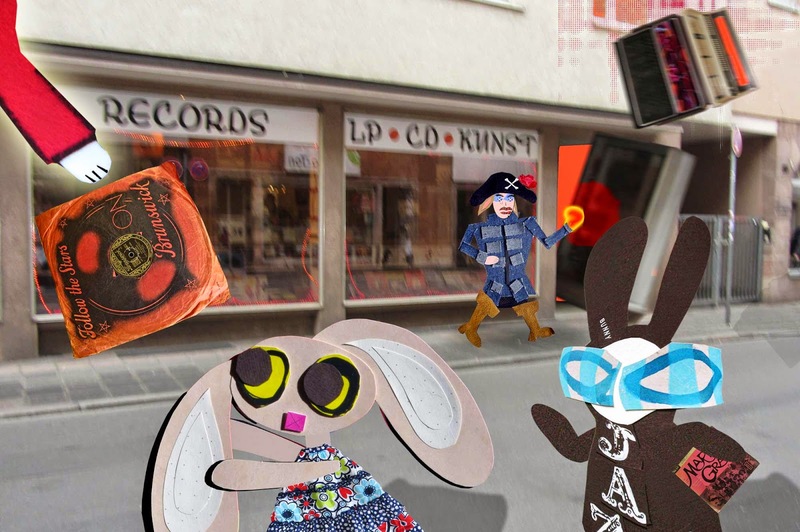 The Wabbit glanced down to make sure of a record he'd grabbed on his way out. "Why that one? yelled Lapinette. "Bourbon Street Blues," grinned the Wabbit. "Up here!" A familiar voice issued from above and, as if by magic, an arm appeared. "Now's the time," yelled the Wabbit. "It's now or never!" Lapinette summoned all her strength, concentrated on the disc and willed it to fly. The record shot from her paw with enormous speed and straight into a waiting paw. Bits of record store were still settling in the street but they heard the voice murmur. "Gotcha." "I wasn't expecting you, your Holiness," puffed the Wabbit. "Where is the foul transgressor?" asked the voice. "Still inside the store," said Lapinette. There was a rather jolly laugh. "Shall I command the Devil to depart?" The Wabbit smiled. "He finds it hard to take instruction ..."